Before you even lay a finger on the guitar fretboard, it's beneficial (and important) to spend five or so minutes doing some simple finger stretching exercises. Just as you would warm up and stretch before working out at the gym or playing sport, the same applies for using your fingers! A lot of guitarists neglect the warm up and then can't believe how much better they play once they start adding these exercises to their routine. They really do loosen up your fingers and allow you to make more awkward, quicker movements on the neck. First, we need to stretch the joints in our individual fingers. 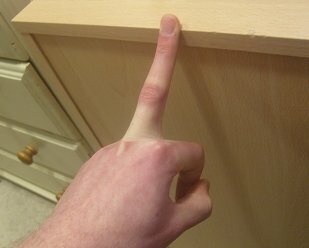 You can use the edge of a table or desk to stretch each finger. Simply place the tip of each finger on the edge of the table/desk, keeping your finger straight and in line with the top surface. Slowly push down so your finger bends back and you can feel it pulling. Do this slowly and carefully! Apply the same method for all four fingers. Notice how my other fingers are closed against the palm. This helps to encourage finger independence. Let's not forget the thumb, which has to endure a fair bit of pressure on the back of the guitar neck. 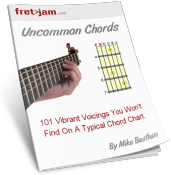 You'll also want to stretch your thumb if you're playing fingerstyle. This time I'm simply giving the "thumbs up" and gently pulling the thumb to the side with my other hand. It might help to open and close your other fingers while the thumb is held in this position. 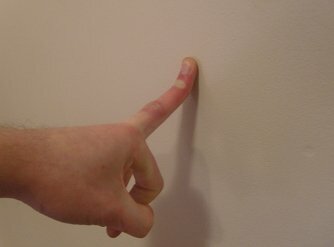 You can also use a similar method against a wall (or just use the flat palm of your other hand as the "wall"). 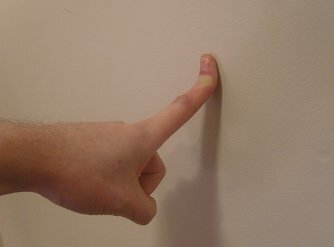 Point to the wall using each of your fingers, again keeping the other fingers clenched against your palm. 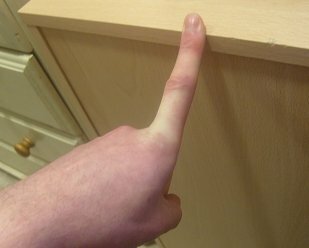 Slowly push your hand towards the wall, keeping the finger straight. Now, slowly clench that same hand into a fist, tighter and tighter. Make sure it's a gradual tightening. No sudden movements. You'll probably feel a weird burning sensation because your fingers will still be in their stretched position from the other exercises. Unclench your fist and then clench again. The sensation will soon disappear. 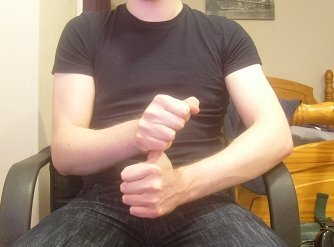 Again, slowly clench and unclench (your fist...) about 10 times and then repeat the desk/wall and fist exercises a couple more times. Do the same for the other hand, especially if you're playing fingerstyle. Wiggle your fingers around a little. Shake your hand as you would if you'd washed your hands and there was no towel to dry them! All that should only take you 3 minutes max. OK, now it's time to pick up the guitar for some more finger stretching exercises. Before we actually use our fingers on the fretboard to warm up, we can use the neck of the guitar for one final stretching exercise. 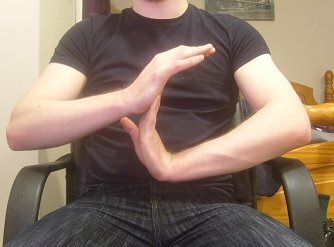 Simply create a V shape between two fingers at a time and lodge the neck between them, pushing them apart. You might want to hold the top of the neck as you do this (close to where the neck meets the guitar's body) so you don't put too much pressure on the neck. Push gently against the neck to stretch out your fingers. Do this for each finger pairing for a total of 2 minutes. 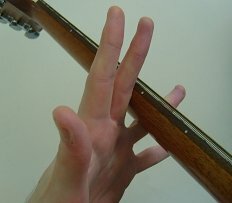 If you prefer, you could simply part your fingers into the V shape using your other hand, but I find using the guitar neck gives you a more solid pressure point. Your fingers should now be loose and ready to play and it should have only taken you about five minutes in total!